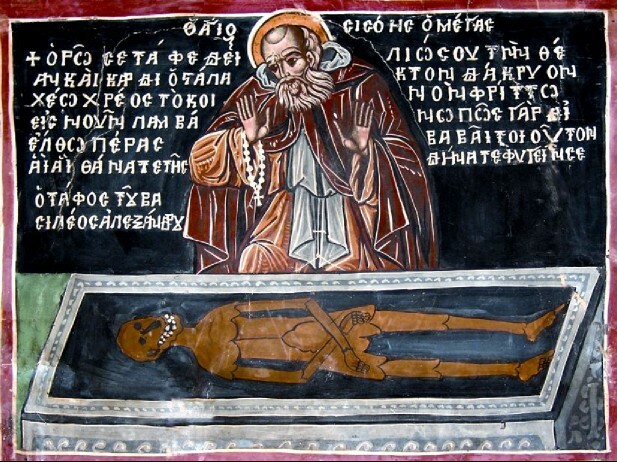 The astonishment of Sisoes has been an icon of contemplation for all Christians, especially for monastics, since the 15th century and has spread so much in popularity that it appears throughout hundreds of Greek churches and monasteries. Among the most famous come from Holy Trinity Monastery and Varlaam Monastery at Meteora, and Hosios Loukas. The site of the church where this icon usually appears is on the opposite side of the altar area as people exit the church, where also the Dormition icon of the Theotokos also appears. It is wisely placed here so Christians can contemplate death as they leave the church. It is not implausible that the depiction of Sisoes lamenting over the tomb of Alexander is a historical event lost to us in document form but survives only in iconography. In many ways, the iconographic tradition is just as reliable historically as is a written document. Since Sisoes was a contemporary of the time of the destruction of Alexander's tomb, I would find it difficult to believe that such a wise disciple of Anthony the Great living outside Alexandria would not at least make some comment in this regard.